As the second of a new generation of vehicles built on an all-new platform, the 2018 Stelvio epitomizes Alfa Romeo's La meccanica delle emozioni (the mechanics of emotion) spirit, delivering race-inspired performance, real-world driving confidence, state-of-the-art technologies, seductive Italian style and an exhilarating driving experience to the premium mid-size SUV segment. "The all-new Stelvio, named after one of the greatest driving roads in the world - the Stelvio Pass in the Italian Alps - sets a new benchmark for the segment," said Reid Bigland, Head of Alfa Romeo. "Stelvio is uniquely engineered to challenge two-door sports cars on the track, without sacrificing any of the characteristics you would expect from a premium SUV, resulting in the perfect mix of high performance, capability and Italian design." 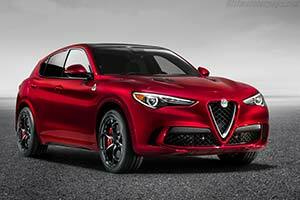 Crafted by Alfa Romeo artisans at the Cassino plant in Italy, the all-new 2018 Stelvio lineup is a testament to Alfa Romeo's perfect balance of engineering and emotion, creating a premium mid-size SUV for driving enthusiasts that stands out in one of the largest and fastest growing segments in the U.S.
With the most powerful Alfa Romeo production engine ever, Stelvio Quadrifoglio highlights Alfa Romeo's performance and motorsport pedigree as the "halo" model in the lineup.